You get Thunderbolt 3 on the new Dell XPS 15 (bottom) and the new Dell XPS 13 (top) but only the Dell will charge from the port. Getting inside the Dell XPS 15 is a snap and gives you access to the two RAM slots and M.2 drive. The CPU and GPU are permanent of course. 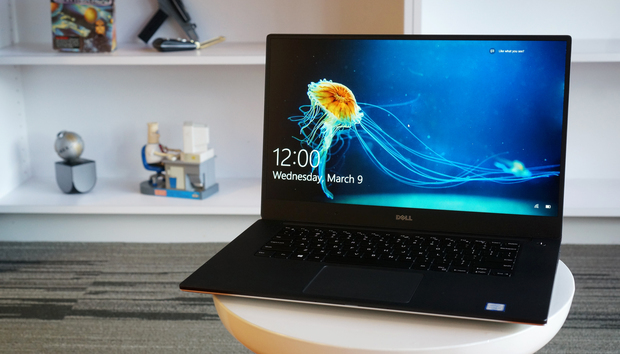 For this particular model, you can mitigate the shorter battery life with Dell’s optional battery pack, which will let you run and charge the laptop from it. In higher-end configurations with the 84 watt-hour battery, I’d expect to squeeze out at least another few hours out o. Carrying the XPS 15 around in your hands is a pleasure, thanks to the rubber strips on the bottom. A lot of these metal-bodied laptops feel like they’re just one slip away from disaster, but you’d have to try to drop the XPS 15 for destruction to happen. The XPS 15’s keyboard could be bigger. The backlight-bleeding issue could use some work. But the overwhelming amount of people interested in this size of laptop buy these machines for performance, and that’s where the XPS 15 shines. Sure, it’s not quite the tiny, game-changing laptop that the XPS 13 was, but that’s not entirely fair. As anyone who has suffered sibling rivalry knows, sibling means sibling. Not twin. Siblings have to find their own path forward, not just follow, and the XPS 15 does that quite well. « iPhone buying guide: Should you buy an iPhone SE, a 6s Plus, or wait for the next one?